The generator set is CSA certified, file #LR 955. UL 2200 listing is available. The generator set engine is certified by the Environmental Protection Agency (EPA) to conform to Tier 4 nonroad emissions regulations. 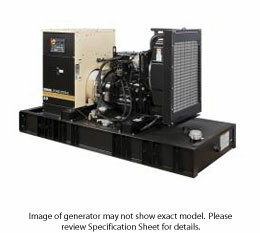 The generator set meets NFPA 110, Level 1, when equipped with the necessary accessories and installed per NFPA standards. Two- and five- year extended warranties are also available. Four-point mounting with vibration isolators. The brushless, rotating-field alternator has broadrange reconnectability. Customer connection box with field-connection terminal blocks. Rotors dynamically balanced to minimize vibration. Copper windings to ensure minimal heat buildup. Insulation meeting NEMA standards for class H insulation. Generator direct connected to the engine. Sealed precision ball bearings with a precision-machined steel sleeve in the end bracket to prevent shaft misalignment and extend bearing life.